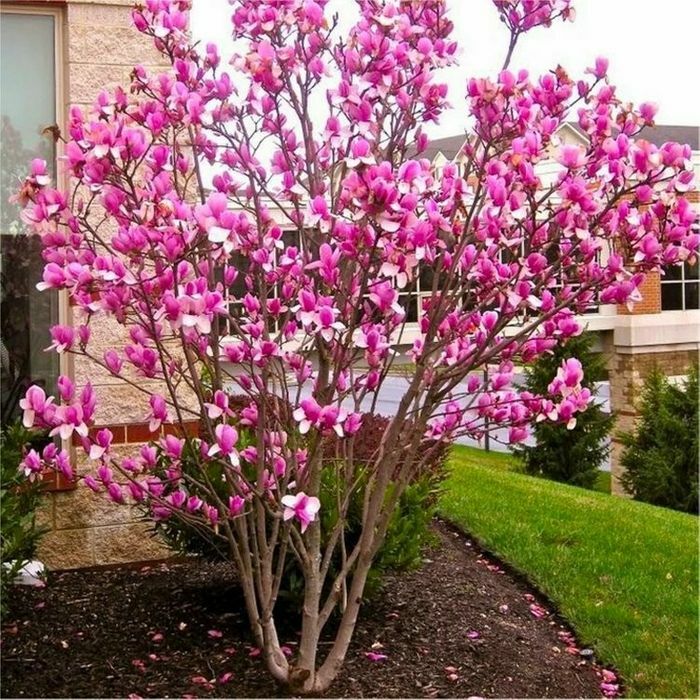 Magnolia Rustica Rubra is a smashing small tree that will make a wonderful specimen contained in a nice planter or set out in the garden. Rustica Rubra is sought after thanks to its ability to bloom twice every year - in Spring, and again in late summer, along with its easy going robust nature. This variety really is exceptional, requiring little maintenance and aftercare it will produce an abundance of deep pink-red-purple flushed flowers, with petals that appear creamy-white on the inside when they open. The large Goblet shapes flowers 15-20cms (6-7inches) in size are a glorious sight to behold, carried on robust compact growing shrubs or small trees, generally growing 2-3 metres (6-10ft) tall over time, and eventually reach double this height over a couple of decades if you do not prune. Magnolia Rustica Rubra's flowers will bring cheer for several weeks before making way for the foliage. A truly magnificent variety for it's abundance of flowering combined with the delightful colouration. Supplied as a bare root tree with an overall height of around 120-125cms (4-5ft). What do you think of this Gardening Express deal? How beautiful is this, am going to order fof my front garden. thanks for sharing.